Dell's Studio 15 greatly impressed us last year by combining power, usability and features at a truly affordable price, and even won our award for best laptop of 2009. It has now been updated with Intel's latest quad-core technology, making the Studio 1557 even better. Performance is staggering. The Intel Core i7 processor more than doubles the power of the previous dual-core Studio 15. Multiple applications can run simultaneously with stunning speed and reliability, making this one of the most powerful laptops you can buy at this price. Graphics performance is equally impressive. The dedicated ATi graphics card is designed to smoothly process high definition (HD) video and also provides power for basic gaming. An HDMI port is in place for connecting to an HDTV. Predictably, this power impacts on mobility. While previous Core 2 Duo models ran for as long as 293 minutes, this latest machine runs for just 186-minutes. Bear this in mind, as a Core 2 Duo machine provides ample power for most users and Core i7 will be overkill for many buyers. The impressive build quality of the previous model remains and you can customise the chassis with various colours and designs. The glossy lid of the basic model is a magnet for fingerprints, but a tougher matt finish can be added for £29. The keyboard is equally well made and extremely comfortable to use. All the keys are large and feature a smooth, tactile finish and respond accurately and quietly, even when typing at speed. The entire board is also backlit, making it easy to keep working in low light conditions. 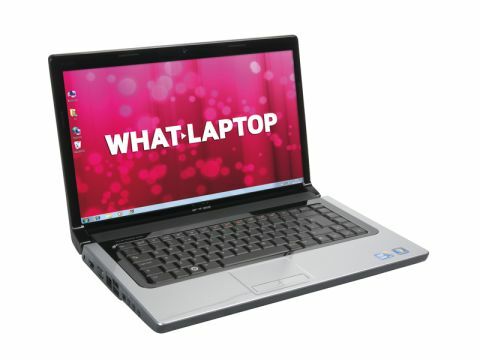 The 15.6-inch widescreen panel is equally well made and ideally suited to entertainment use. Impressive brightness levels and strong colour and contrast bring photos and videos to vivid life. The capacious 320GB hard drive will easily hold all of your music and photos, while the 8-in-1 card reader provides comprehensive support for storage card formats. A slot-loading, dual-layer DVD rewriter is also in place and can be upgraded to offer Blu-ray support for £100. Rounding out the impressive specification is 802.11n Wi-Fi, Gigabit Ethernet and an eSATA port for high speed data transfers to external drives. An integrated webcam is also in place and Microsoft Works software is installed as standard, providing basic home office tools. Building on its already strong foundation, the Studio 1557 makes stunning quadcore performance truly accessible to the consumer market. While the restrictions it places on mobility are unfortunate, they were inevitable and do little to flaw this impressive portable.